Only rarely would a project come across the desks of UrbanMelbourne.info that has the ability to stupefy all that see it. Denton Corker Marshall (DCM Architecture) recently upgraded their website and nestled in amongst a gaggle of great projects was their unsuccessful bid for Monash University's forthcoming Law, Business and Economics Complex at their Caulfield campus. Very rarely does a design of this ilk come along which oozes a certain landmark status; unique in both looks and quality it would have been a building unlike any other in Melbourne. With two main volumes divided by a trademark splash of yellow the DCM scheme would have been incredible if realised. The renders within the article slideshow show the design from even more impressive angles yet the image below highlights the cantilevered nature of the design. The seemingly haphazard nature of the scheme's windows leads to a fascinating facade but for mine the designs best feature - the continuation of the facade treatment to the under floor of the overhung sections. It's likely they wouldn't have been transparent, yet if they were transparent what a sight that would be for the fortunate few looking down. Simply a design that makes you think - Dammit! Just build it anywhere in Melbourne and I'd be happy! Of the initial forty or so entires for Monash University's new building a shortlist of five schemes were assembled for consideration. Joining DCM Architecture at the time were OMA and Donovan Hill, Grimshaw Architects with NMBW and Kerstin Thompson Architects, ARM Architecture and McBride Charles Ryan. Quoting ArchitectureAU, " The proposed new Law, Business and Economics Complex is expected to bring more than 6,300 students and 714 staff to Caulfield, transforming the campus into the hub of Monash’s social sciences teaching, learning, research and public programs, as well as adding significantly to the diversity of the campus and community surrounds. 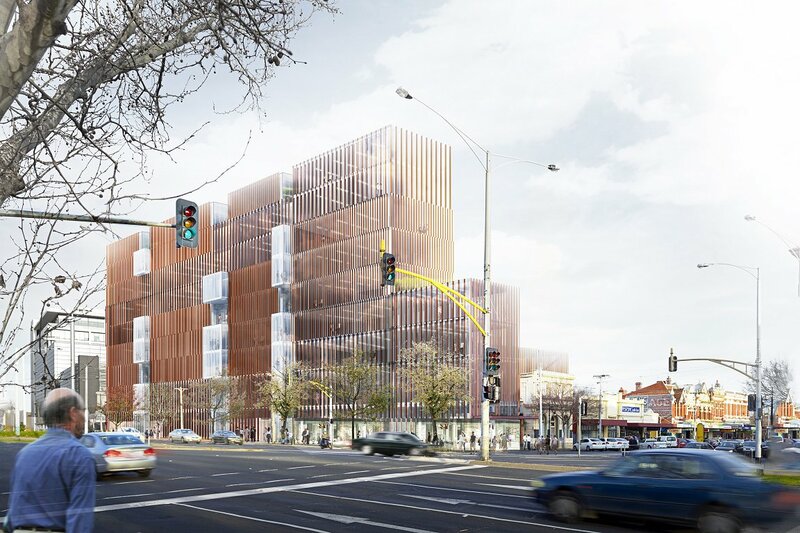 Occupying a prominent corner site on Dandenong Road (Princes Highway), the complex will have about 20,000m2 of floor space with teaching spaces, seminar rooms, lecture theatres, small group (syndicate) rooms and offices." Seen below is an image of the joint Grimshaw Architects + NMBW + Kerstin Thompson Architects scheme, that was kindly passed on by Kerstin Thompson Architects. The nine level complex featured a heavily glazed southern facade as opposed to the Dandenong Road frontage which featured a facade dominated by vertical fins punctured only by protruding glass pods. 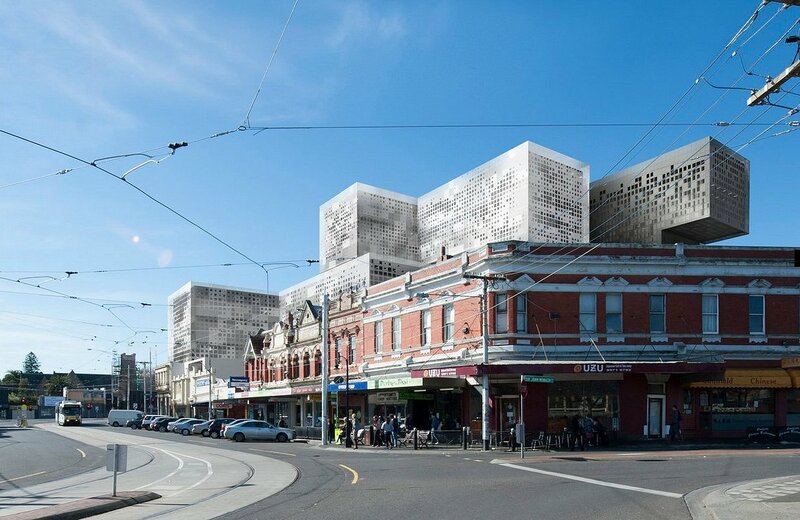 As disappointing as seeing designs the calibre of DCM's unrealised, much solace can be taken from McBride Charles Ryan (MCR) winning the design competition for Monash University's requirement. 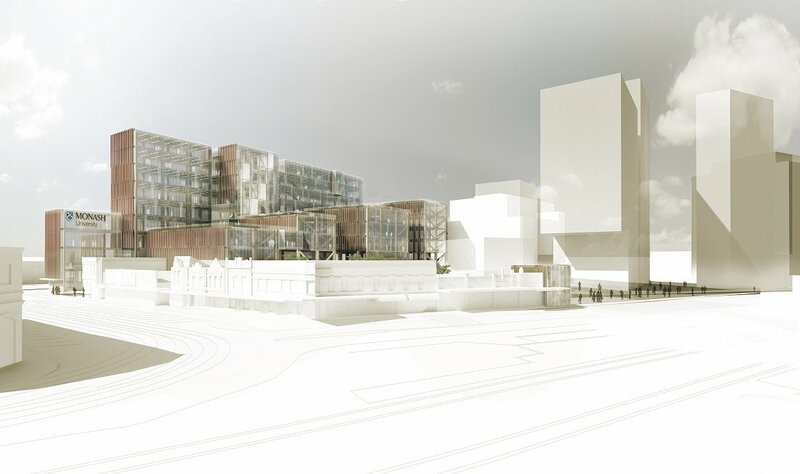 With projects such as Grocon's CUB site, MAB's The Quays and the Victorian Comprehensive Cancer Centre under their belt there can be two certainties for Monash University; the design will be spectacular and there will be MCR purple in the design. See below images of DCM Architects, KTA + Grimshaw + NMBW and OMA + Donovan Hill's unsuccessful bids for Monash University's Law, Business and Economics Complex. 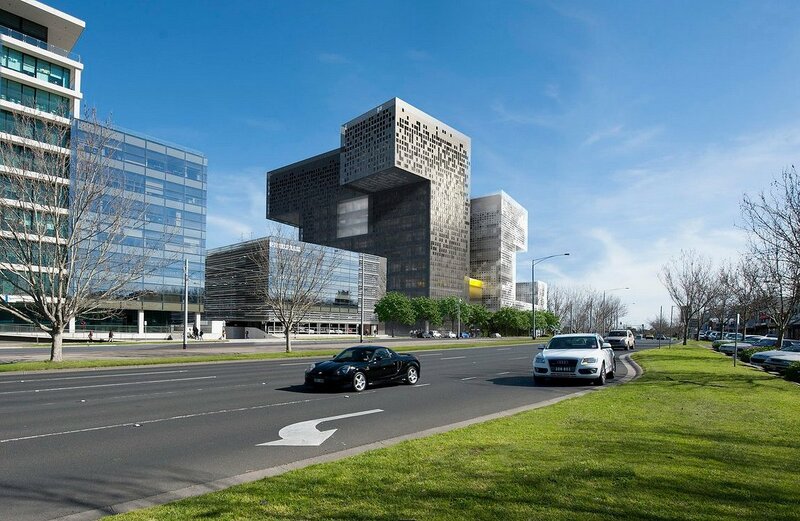 DCM design - Dandenong Road east perspective. Image © DCM Architects. 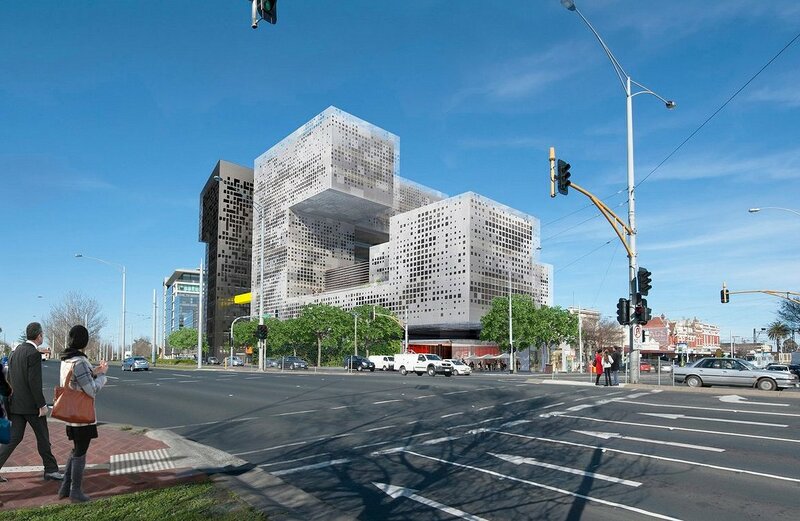 DCM design - Dandenong Road west perspective. Image © DCM Architects. DCM design - Derby Road perspective. Image © DCM Architects. Good bye ye aulde Shopping Centre entrance on Dandenong Road. Too bad we couldn't have two winners. Really like the quality of the entries, good for Melbourne! Great design but it likely would have cost a considerable amount to build. 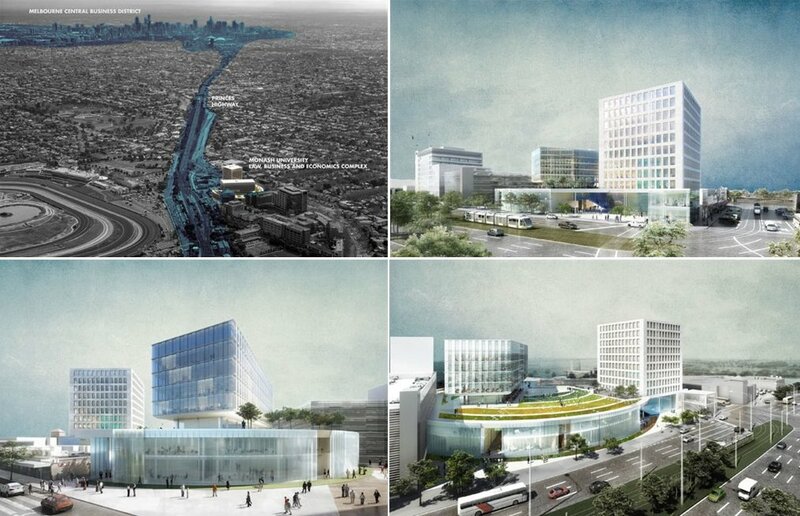 The design chosen is very promising also, which is a great outcome for that area.